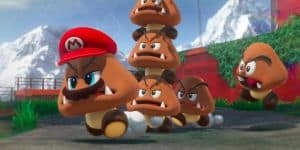 Super Mario Odyssey: It's Capture Not Possession | Nerd Much? When we saw the E3 trailer for Super Mario Odyssey, it was easy to call what Mario does with his hat “possession.” He didn’t put on a costume, no racoon or frog here, nor did he begin to wear a different hat. No, this time Mario throws his cap at other enemies and it seemed like he went “into” them somehow. It did not slip by one Twitter user, who made the pun that of course it is “CAPtured” after all. Other Twitter users are still sure the act has far more to do with possession than capturing, but the official word is out and there’s no refuting it. If the capture mechanic isn’t weird enough, you can also do it to the normal sized people of Mario’s world. Seeing people, especially not drawn in the same cartoonish way as Mario, has set an uncanny edge to the game. It’s made the Mario game feel very different from what fans are used to coming out of Nintendo. Hopefully it helps players to call it capture instead of possession. It’s a little less creepy to be sure. Super Mario Odyssey comes out out October 27, 2017.